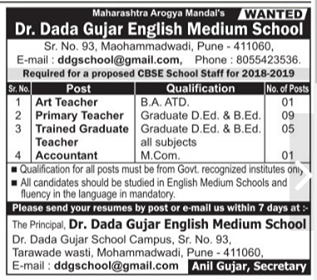 Dr.Dada Gujar English Medium School, Pune has advertised in LOKSATTA for the recruitment of Teachers jobs vacancies. Interested and eligible job aspirants are requested to apply with in 7 days. Check out further more details below. About School: In 2015, Maharashtra Arogya Mandal started Dr. Dada Gujar English Medium School (DDGEMS) at Mohammadwadi, Pune with aim of imparting English medium eductaion at affordable cost. The school is to be affiliated to CBSE in near future.